last week kevin low and me shared personal views on the issues surrounding todays practices generally, but more specifically on own accounts of projects undertaken by our practices whether conceptual or otherwise. 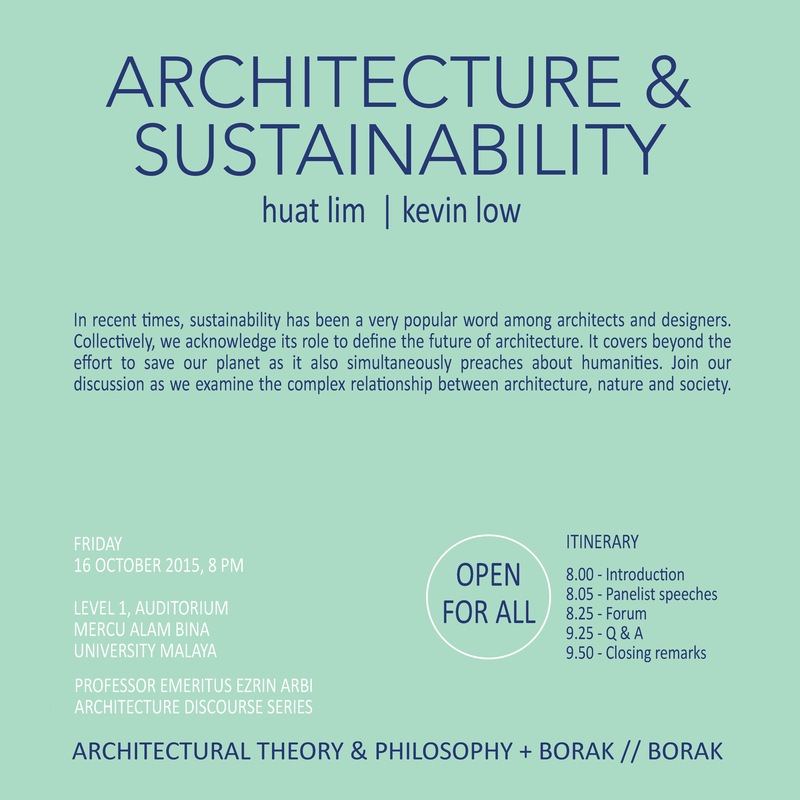 the lecture was designed by the university of malaya as part of their professor emeritus ezrin arbi lecture series, a clever and delightful manner of introducing theory and argument, so that as a discourse this can be taken as an elective module for philosophy and theory in architecture program. in the presentation, attended by as many as 150 students and professionals, the modus operandi turned around to invite questions from the floor. the mood of the event was a little tense in the beginning but quick to lososen up lettign more aggressive and directed or not so gentle questions to come from the floor. although my personal hope was to see deeper insightful and investigative probing and intrusive personal remarks aimed at the theories put forth, it became a platform or opportunity to question the aestheticss of buildings we designed rather the merit of what was preached and practiced amd measure that against the will of the audience. this was not at all irrelevant, but the outcome, to my mind was not as ambitious as we could have made it out to be. i would have welcomed many more views on this point. furthermore, a very delightful thing i found was one question raised by stephanie, about whereforth is our national identity, which in all these inquiry we would by itself have suggested the issue to be have been considered a very valid tangent approach to investigate and examine the very question of sustainability. and just before that we were asked to defend also the concept of timeless design, albeit any rationale to claim for a defensible approach, such as the need for mechanically assisted air conditioning, or if these are indeed the evils of the new regime for a mechanised architecture, the choice of using of failed local materials and seemingly poor objectivity and hindsight in resorting to use patterns as a form giving methodology to an iconic facade. in fact there were many interesting issues that came up, eventually, even that of picking out on failed commercially driven practices, or an attempt to pointing out ways for the young and enterprising budding ecological or sutainable enthusiast architect to embrace truths in their ways and career as an architect, if ever such a thing would bring any meaning at all to him. or why it would even matter if in the end we have road map that points to reversing everything we have done to where we started in the fifties slowly going back as far as the medieval times and perhaps further back. are we contemplating to go back to live in caves or under a rain tree or that we might consider to opt for a farming life (didnt we envision green cities, or vertical farming, so what was that about) to put forth a sustainable equity and whose resolve can be in the hands of modern city dweller who can now wish for neighbourhoods wothout motor cars and railways stations and traffic congestion. we spoke of dense cities and rapidly changing and advancing technologies, but not of pollution, depleting natural resources and affordable real estate. so the forum has covered many issues, and the follow up could go a long way to cover these aspects of sustainability very deeply and more importantly bringing great value to our young and ready talent and in arousing intellect in local universities. i am indebted to the university of malaya.